Welcome to Moose Hollow 308! Enjoy the breathtaking Wasatch Mountains from the comforts of this newly updated three bedroom condo. Sit and chat with your friends on the outdoor patio, lounge in front of the 55" television, swim in nearby Pineview Reservoir, or head up to the mountain for some world class skiing. Main Level: Kitchen, living room with TV, fireplace, full bathroom, balcony, and bedroom. 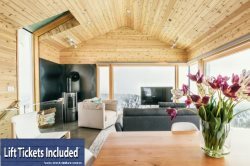 We are truly excited and honored to share our homes with each and every guest and we invite you to stay with us at Powder Mountain Getaways - MH308!